Access to Odoo object methods (made available through XML-RPC from the server) is done via openerp.Model(). It maps onto the Odoo server objects via two primary methods, call() and query(). Odoo has powerful grouping capacities, but they are kind-of strange in that they're recursive, and level n+1 relies on data provided directly by the grouping at level n. As a result, while openerp.models.Model.read_group() works it's not a very intuitive API. equivalent to openerp.web.Model.query() but pre-filtered to only include the records within this group. Returns a Query() which can be further manipulated as usual. For this, a lower-level API exists on on Session() objects (usually available through openerp.session): the rpc method. 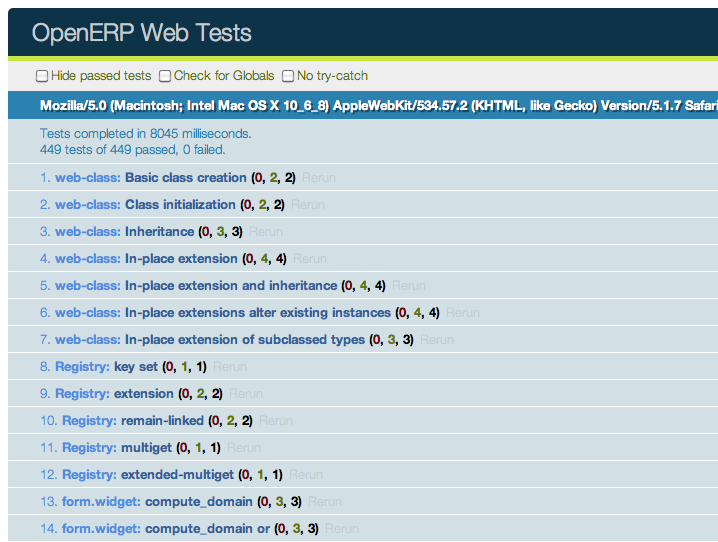 All testing helpers and structures live in the openerp.testing module. Odoo tests live in a section(), which is itself part of a module. The first argument to a section is the name of the section, the second one is the section body. If it matches the pattern model:method (if it contains a colon, essentially) the call will set up the mocking of an RPC call straight to the Odoo server (through XMLRPC) as performed via e.g. openerp.web.Model.call(). Install unittest2 in your Python environment. Both can trivially be installed via pip or easy_install.